William D. Jones, MD, has maintained a private practice in OK since 1994. Outside of the office, he pursues a diverse range of interests that includes Irish Setters. William D. Jones, MD, serves as the dog-show secretary of the Irish Setter Club of Central OK, a member club of the Irish Setter Club of America. 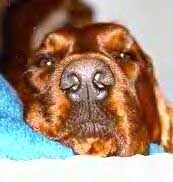 Irish Setter Club of America members and members clubs must comply with several principles set forth by the club. They must take good care of their dogs as well as those entrusted to their care, maintaining high standards of cleanliness and health. Members must also learn about the breed and use the information they learn to breed healthy, well-tempered animals. Members who participate in breeding activities and sell animals must provide accurate written records of the health and pedigree of all dogs. As part of their duty to the overall health of the breed, members should avoid selling to wholesalers, research laboratories, or retailers. They should also take precautions to prevent animals likely to pass on hereditary defects from breeding.